Hell Yeah returns with four remixes of this Alexander Robotnik 'Undicidisco' track from the archives, taking you down a different path with each cut. The A side sees the classic Justin Vandervolgen Edit layering the beat and synth bassline, before unleashing the all too familiar melody whilst re-imagining some of those synthesiser arps over the top. Bawrut then provides an acid laden interpretation of the original coupled with latin styled whistles, percussion and vocal cry of 'uno, dos, tres, eyhh'. Flip it over and Prins Thomas offers up a tougher Discomiks remix with a gritty bassline, interspersed with filtered arps and the warped Robotnik melody. To close out the e.p. The Vendetta Suite Stone Tape Remix takes you down a weird and wonderful path of wonky tape delayed goodness - contorting, reversing and reworking the synth lines to create a unique slowed down version of Undicidisco. 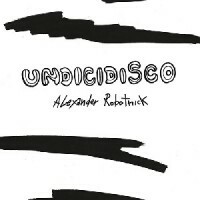 Patrick says: In case you've been living under a rock for the past few years, you'll have heard the ripping electrodisco pulse of Alexander Robotnik's "Undicidisco" tearing the club a new one. Now the ace Italian label send the stems to an A-team of experts for a killer remix 12". JVV does his edit thing, adding extra psychedelic splendour to the O.G. before Bawrut flips it into an NY / Miami fusion. Flip it for an intergalactic techno excursion from Prins Thomas, before Hell Yeah affiliates Vendetta Suite take us on a strung out journey into outer space.